Enable/disable call alerts in Samsung galaxy S9 and galaxy S9 plus. You can disable vibrate on call answered in galaxy S9 and galaxy S9 plus under call settings. In galaxy S9 call alert settings, you can see call vibration settings, status tones and notification & alarms notify during calls. By default disable both vibrate when answered and vibrate when call ends. If enable in your devices, whenever incoming call receive or end calls, you’re galaxy S9 and galaxy S9 plus vibrates. Also play tone when call connects and when call ends in your devices. You can also set phone sound as vibrate using sound and vibration settings in S9. Follow below given step by step process to enable or disable vibrate on call answered in galaxy S9 and S9 plus. There are two ways to enable vibrate when call ringing or connected on galaxy S9 and galaxy S9 plus. Here you can see galaxy S9 phone settings and call settings including hide contact without numbers, block numbers, show caller information, show calls in pop-up, call alerts, answering & ending calls and more. In Samsung S9 & galaxy S9 plus call alert settings, you can see vibrations, status tones and notifications & alarms section. If can’t vibrate your phone while phone call ringing, turn off it in your device. 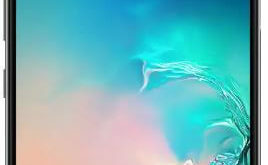 In other S9 vibration tips, you can change vibration intensity and vibration pattern on galaxy s9 and galaxy S9 plus Oreo devices. And that’s it. 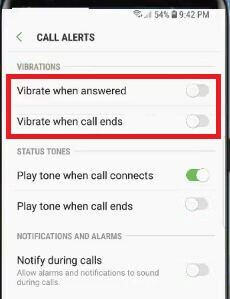 Do you still have questions about disable vibrate on call answered in galaxy S9 and S9 plus? Feel free to leave them in below comment section. 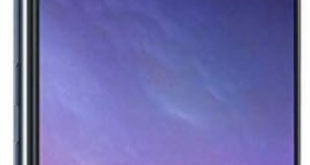 Don’t miss out to check our other tutorial.